Sony has hinted that it is looking into virtual reality gaming and is working on creating its prototype VR headset for the mass market. 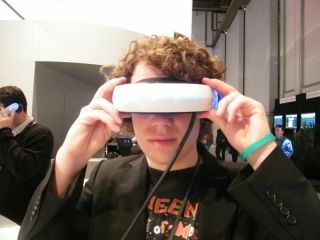 One of the more intriguing finds at CES 2011 was Sony's VR headset. Although it was a mere prototype, TechRadar managed to bag a hands-on with the device but it was only really a version of what Vuzix is offering – portable gaming and cinema in glasses form. In an interview with Develop, however, Sony's Mick Hocking revealed a little bit more about the technology, explaining that head-tracking was the key to making virtual reality gaming a success and that is what they are developing right now. "We're working with a couple of games at Sony that are experimenting with virtual reality type experiences," said Hocking. "At the moment it's just a head-mounted display; the head isn't being tracked – but that's something we're doing R&D on. I have to say, what we've done in the R&D projects has just been fantastic." When asked whether he thought virtual reality could make a resurgence – and presumably shake off the horror that was The Lawnmower Man – Hocking explained: "Yeah it could be, it certainly seems possible, and these head-mounted displays incorporate 3D tech. It's very, very cool. "And obviously it's a fantastic way to experience 3D because both images are being directly fed into each eye."